Palestinian Prime Minister Ahmed Qurei has agreed to remain in his post for the time being, three days after tendering his resignation. 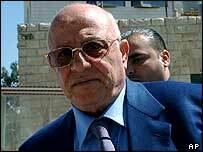 Mr Qurei is reported to have accepted Palestinian leader Yasser Arafat's decision to reject his resignation. He had been insisting that he wanted to quit over the growing lawlessness in Gaza and inaction over reform. The Palestinian leadership is embroiled in a crisis over who should run the security and intelligence services. Mr Qurei decided to stay on during an emergency cabinet meeting at Mr Arafat's headquarters in Ramallah, an adviser to Mr Arafat told reporters. "He is the prime minister and he will continue being the prime minister," said Nabil Abu Rudaineh. But some officials who were at the meeting said Mr Qurei had agreed to stay in the post only in the short term, after Mr Arafat again refused to accept his resignation. Mr Qurei "told Arafat that his government must have real authority, especially over the security branches in order for it to be effective", said cabinet minister Qadoura Fares. Mr Qurei left the building by a back door, refusing to talk to reporters. Militants demanding an end to corruption and cronyism clashed with security forces at the weekend, prompting international concern at the unstable situation in Gaza. 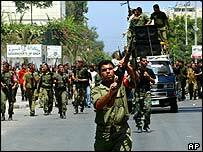 Later on Tuesday, a ministerial team set up by Mr Qurei is to hold talks in Gaza with both sides. The US and the United Nations are pressing Mr Arafat to relinquish control of the security forces to a central command. Mr Arafat "should really take the time to listen to the prime minister and other members of his leadership", said UN Secretary General Kofi Annan. Mr Arafat has already backed down in the face of widespread public protests over the appointment of his cousin, Moussa Arafat, as head of security. But correspondents say Mr Arafat is reluctant to cede control of the security forces because they form a key pillar of his rule. The BBC's Alan Johnston in Gaza says a divide has opened up between Mr Arafat's established old guard and a younger generation that is convinced the Palestinian Authority needs to be extensively reformed. Israel's planned disengagement from Gaza by the end of 2005 is also increasing the tension as factions jostle to be the one left in control. "A prime minister unable to resign"